Here are the plans for the upgrade to SH1 on the Hataitai side of the Mt Victoria tunnel. Apparently, its only planned to have four lanes now (rather than six? ), but the upgrade will still take in quite a bit of the town belt and affect properties along Moxham Ave. You can see how much the new road encroaches on the town belt as shown by the fact that it goes through part of the existing badminton courts. 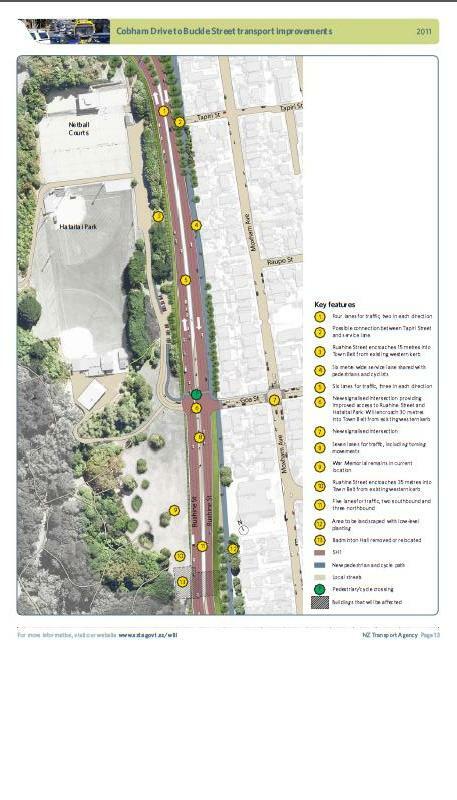 There are plans for a cycle way and walkway, as shown on the eastern side of the road. There are also plans to have traffic lights at the Goa Street intersection. I can understand the need for something here, although it will slow down traffic flows. However, many of us will have had the frustrating experience of coming from the netball/badminton courts on a Saturday, and trying to turn to the south, or even trying to go straight across into Goa Street- just about impossible at some times of the day! With all the attention on the city side of the tunnel, I think its important that the upgrades on the Hataitai side are well thought through as well, so eastern residents get the best deal possible.